Patricia Jabbeh Wesley was born in Liberia, West Africa, and spent her childhood in Monrovia. She lived with her mother, while not away at boarding school, until she was fourteen. At that time, she decided to move in with her father and his family in order to attend better schools. She began to write at a very young age and her father was very supportive of her work but was concerned that, being female, someday she would have to give up writing in order to tend to her family. Although she has four children, she has managed to succeed at being both a mother and a writer. Due to the upheaval in her life, she now considers herself to have a triple heritage as “an African, a woman, and an immigrant” (“Abstract”). Wesley began her higher education at the University of Liberia, moving on to graduate studies at Indiana University in Bloomington, IN, where she received her master of science in English education, returning home to Liberia in 1985. She immigrated to the United States in 1991 during the horrific Liberian Civil War, and settled with her family in Michigan. After the publication of her first book of poems in 1998, she returned to school in pursuit of a doctorate in English and creative writing, which she obtained from Western Michigan University in 2002. She has taught English and literature at the University of Liberia, African and African American literature as well as creative writing at Western Michigan University. She currently resides in Altoona, Pennsylvania where she teaches English and creative writing at Penn State Altoona. About the central Pennsylvania landscape, she says, “I am still discovering my new surroundings of hills that are almost mountains, where just below every hill is a deep valley. I love the beauty of the endless hills and secret valleys” (“Biography”). Wesley’s first two books of poetry share the same underlying concerns: family, community, war, and the connections among them. She is adamant that her poetry is not political, despite the fact that politics play a major role in her work: “I believe politics is part of life and life is political. My poetry is just portraying the kind of life we live and the kind of life I’ve lived” (personal interview). Her work is a reflection of a multitude of influences. Among them are African oral traditions, the American narrative, African lyricism and war protest poetry. She also finds that listening to African music brings memories from her childhood to the fore-ground of her mind and these memories are often the touchstone for her poems. In addition, she cites many English, European, and American poets as influences, such as Robert Frost, John Pepper Clark, Wallace Stevens, Galway Kinnell, E.E. Cummings, John Donne, Andrew Marvell, and William Carlos Williams. She admires Sylvia Plath’s “ability to make abstract images seem concrete” and Ann Tyler’s aptitude for “captur[ing] the family in its worst moments” (Wesley, personal interview). As a child, she read the Psalms and Shakespeare—both for their poetry. In Before the Palm Could Bloom, Wesley tells the story of Liberia through the voices of several people, but not herself. She says her work “allows a glimpse of life before and during the war as well as the distraught aftermath of the war” (Personal interview). Families are lost and scattered, tarnished by atrocities committed both on them and by them. Death is a constant theme: “[i]n their shallow graves the corpses / dance Liberia’s cradles empty (Before the Palm 21). Intermingled throughout her poems are African idioms, now almost prophetic in retrospection, “the hen that scratches too hard digs up its mother’s bones” (21). Wesley often writes poems that she thinks of as “triplets, or twins.” She explains, “[t]he images are so overwhelming and the inspiration is so overwhelming that many times I will write three poems in the same evening and the three poems are usually interrelated.” By way of example, she cites “I Used to Own This Town” and “Get Out of Here Boys,” which were composed simultaneously (personal interview). While there are slight differences, these two poems are extremely close in subject matter. They depict scenes from her childhood in Monrovia in which she recalls playing in the streets as a child (Becoming 4-6). Strong women abound in Wesley’s poetry. And in many cases, the older generation grieves and worries about the younger, as in “The Corrupt Shall Rise Incorruptible”: “Right down Nile Street in Heaven, I pick a house / where I sit, my palm under my chin, to worry / about my grandchildren not feeding their children well…” (Becoming 38). Many readers may recognize such fears as universal, allowing them to appreciate the wisdom in Wesley’s poetry. Although she has only published poetry so far, Wesley says, “I think I am a novelist inside. I have struggled to write short stories. In my short fiction classes, my stories tend to go long and develop multi-plots and sub-plots and I make loops and go back” (personal interview). She has also written a children’s book that she is preparing to send out for publication. It is an alphabetical listing of African names in which children on opposite pages introduce themselves and engage in a conversation about cultural differences. Wesley’s interest in children has manifested in other ways, as well: when she lived in Michigan, she conducted over one hundred multi-cultural writing workshops for elementary students. She has kept every thank you letter and drawing she received from these children and hopes one day to find a publisher willing to compile these, as images, into a book (personal interview). In her third collection of poetry, not yet published, she combines her “African-ness and [her] new experiences living in America” (personal interview). Here, readers will find her normal repertoire of strong, multi-generational women, as well as Margaret Fuller and Henry David Thoreau, and myths, such as the mermaid, make several appearances. She hopes to obtain a grant to go home to Liberia in the summer of 2007 in order to collect material for a new book of narratives, “I am interested in bringing the voices of the women who have survived fourteen years of brutal warfare and just listen to their narratives and then put them into a book.” She has recently received a grant from Penn State to examine the stories of Liberian women who were traumatized by the war, and is excited about her project this summer. She is also working on a memoir, in which she hopes to tell “other legs of my stories” (personal interview). Wesley aspires to write poetry that is “crisp, vivid, [and] significant.” As a writer, she counts herself lucky to be a woman having a strong tradition of great storytellers. She describes herself as a “poet who is black, not as a black writer.” When asked to define her role as a writer, she would like the world to realize “we have a common voice, a common theme. I want my work to transcend race and cultural identity” (personal interview). Before the Palm Could Bloom: Poems of Africa. Kalamazoo: New Issues P, 1998. Becoming Ebony. Carbondale: Southern Illinois U P, 2003. “Becoming Ebony: by Patricia Jabbeh Wesley.” ChickenBones: A Journal. 27 Sept. 2004. Killough, Ann. “Navigating Poetic Traditions.” The Women’s Review of Books 21.4 (2004): 17-18. Wesley, Patricia. “Abstract.” The Graduate College: Dissertation Defense page. Western Michigan University. 7 Nov. 2004. —“Biography.” Patricia Jabbeh Wesley. 17 Sept. 2006. Wright, David. “Neighboring Witness.” Nimble Spirit: The Literary Spirituality Review. 27 Sept. 2004. “After All the Flame.” IUP Magazine. 22.1 (2004): 2-3, 22-23. Interview in Bloomsbury Review 23.5 (Sept./Oct. 2003):11-13. 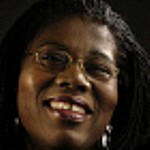 “The Painful, Joyful Heart: A Conversation with Patricia Jabbeh Wesley.” Research Penn State. Penn State University. Sept. 2005. Wesley, Patricia Jabbeh. Personal interview with Brenda McCloskey. 5 Oct. 2004.